This creative poster does a lot more than raise brand awareness. Full Tilt Cycle is a cycling studio located in Peterborough, Ontario and their most recent ad campaign has a unique twist. The poster reads, Sweat. Rinse. Repeat. and the letters of the poster are removable detergent based letters. This creates a washable print advertisement. 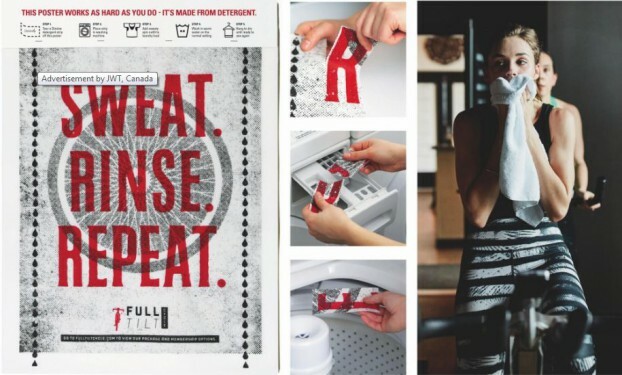 In an effort to show that Full Tilt understands working out = laundry, they created this washable print advertisement where you can peel off the individual letters and toss them into the washer. The posters are made from pre-perforated and dissolvable strips of laundry detergent. Not only do they come with a side of encouragement – “Sweat. Rinse. Repeat” – but they are also eco-friendly, made with detergent paper and special ink, materials that prevent them from discolouring clothes or dissolving during the printing process. And on top of being eminently practical, the posters were made using bike spokes and drops of sweat to match the distressed aesthetic of the studio itself. The washable print advertisement was created with the help of J. Walter Thompson Canada. J. Walter Thompson has been re-imagining the future of brands since 1864. We’re known not only for creating award-winning work, but for achieving many critical firsts in the industry – the first agency to establish a global presence; the first to build a creative department; the first to hire a female copywriter; and the first to establish the Planner role. Have you seen similar products used before? We’d love to hear more about it in the comments below.